FRISCO, Texas — Gumption and honesty are important traits when starting a career, according to panelists representing various sections of the transportation industry. 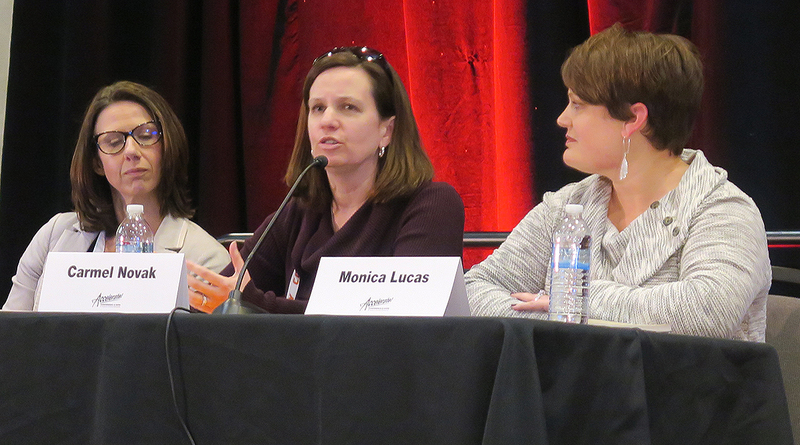 Jessica Herren, vice president of Customs Brokerage and Compliance at CEVA Logistics, encouraged women in the industry to explore the possibilities of different roles. CEVA is a global logistics firm based in London. Herren spoke at the Women In Trucking Association’s annual conference Nov. 13. CAN WE TALK? FMCSA's Cathy Gautreaux values input. Herren said she started her career as a temporary worker and then moved from regulatory compliance to business development. Understanding different roles allows people to learn what they’re good at, Herren said. She also said the trucking industry contains a multitude of areas one can specialize in, ranging from tires and trailers to law enforcement and regulatory issues. Herren said women considering the trucking industry should be honest with themselves and others. She also encouraged women to apply for jobs, even if they seem like far-reaching positions. Honesty is also important in determining which positions are not a good fit, according to Carmel Novak, director of services and solutions at Michelin North America, Inc. Novak, who is originally from Ireland, studied marketing in college. She credits Michelin’s 17-week training program for establishing many important skills and said she continues to learn more about tires every day. Take stock in what other people see and what they say are strengths. Novak balances work with a husband and three kids and heavily values honesty. Novak urged employees to pay close attention to the activities other colleagues tell them they’re good at, because sometimes people can discover talents they didn’t know they had. She also said people should be in tune with what motivates and bores them in the workplace. Monica Lucas, a transportation operations manager for Amazon, agreed with Novak and also recommended that employees set annual goals for themselves and take time to reflect on past successes.